In the Costa Rica Rainforest, on the border of world famous Manuel Antonio National Park, Prana Rainforest Retreat is located. From the Pacific coast of Costa Rica it is just a few minutes away. You can consider Prana Rainforest Retreat as your own secluded resort spa and can enjoy massages, yoga classes and lounge all around. Everyday after taking breakfast you can enjoy beautiful beaches. This retreat center is designed to offer the guests a relaxed and romantic elegance in one of the most amazing places on earth. The Guest Villa of Prana Rainforest Retreat caters to just one couple at any time so it allows the host and owner of the retreat Mark ad Jon to gives their attention on making your tour tour enjoyable and memorable.During the time you will stay at the retreat, you will get the opportunity to take expert massage therapy and can practice Yoga under the guidance of professional yoga instructor. You will enjoy the daily gourmet breakfasts. The guest Villa is about 1400 square feet and there are a private swimming pool surrounded by the lush tropical rainforest. You will obviously enjoy the adventure day trips. In the Villa you will find a king sized bedroom, a very special step through rain shower room which opens up onto your private pool deck, spacious living room. You can enjoy some relaxing time on your private covered deck by the waterfall in a hammock or on the Bali Bed scattered over your private pool side. If you wish you can have a glass of wine on the bed in the living room or just can take a nap on the king sized antique bed. This guest villa is furnished with antique quality furniture which are collected from India, Thailand, Indonesia and the open air designed in such a way that the jungle breezes can pass through and if you want you can also enjoy fully air condition. 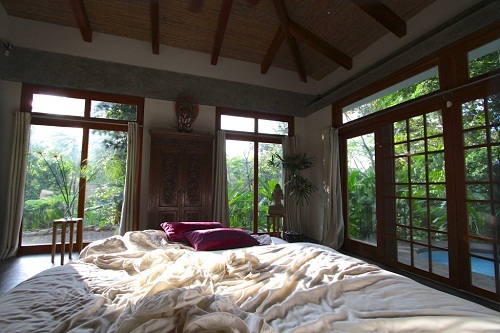 Each and every rooms of these Villa as wonderful view of rainforest. You will get the opportunity to explore the abundant wildlife. Along with the Guest Villa accommodation, Prana Rainforest Retreat also offer our Pool Side Bungalow where you can take your personal trainer, yoga teacher, therapist and even your private chef and the Bungalow will be the perfect accommodation for all of you. This pool side bungalow has its own entrance to the retreat and there you will find a king sized bedroom, a suite bathroom including huge walk in shower and a private balcony. 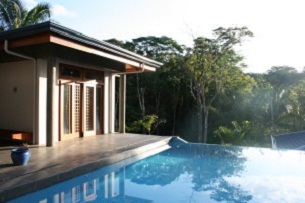 This bungalow located to the retreat’s upper level pool and from there you will be able to see the beautiful view into the surrounding rainforest. If you see to just right above the pool you will see toucans, parrots, monkeys or sloths who actually bought to this property from the National Park. If you reserve the guest villa and the pool side bungalow you can request the pricing and availability along with the Guest Villa reservations. 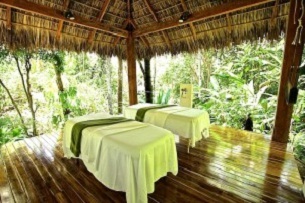 Prana Rainforest Retreat center offers two different packages. Generally the check out time is 11:00 a.m. and check in time is 2:00 p.m. But if you want to check out late or check in early then you will have to ask ahead of time as the retreat should be able to accommodate at no extra charge. Daily one hour massages for each guest. If you want a one hour service then you will have to pay $75 and if you chose one and half hour then it will cost $100 and if it is a two hour session the the payment is $125. The Prana Bed and Breakfast Spa Retreat offers different types of messages including Swedish Aromatherapy, Deep-Tissue and Thia Message. You can chose any of the message therapy. You will also get the opportunity to enjoy waterfall rappelling, night time jungle tours, rafting, zip lining and also many other adventures which make Manuel Antonio famous.